The ideal way to get started in the world of model railways. 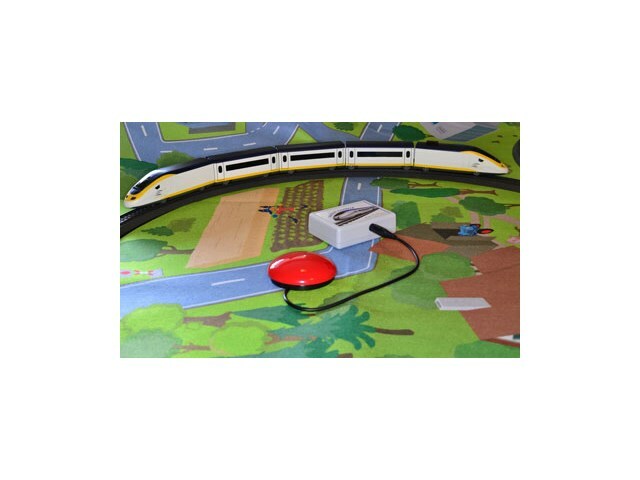 This set is styled on the EuroStar service and comes complete with robust locomotive, coaches, track, hand-controller, play mat and a switch accessible controller designed for switch users. Use any 3.5mm switch (not included) with the adapted controller. With a single switch press the locomotive sets off round the track. The next switch press stops the locomotive. More control is possible with the hand-controller including lights, sounds and direction of the locomotive and also includes a big red stop button.